Made from the nutrient-packed copra, or meat of the coconut, our toasted coconut chips are a delicious snack that provides loads of energy. The meat is sliced out of mature coconuts then gently toasted until golden brown with a dash of sugar and salt. The toasting process brings out the natural sweetness of the coconut meat and turns it from white to golden brown. Professional tasters detect notes of vanilla, yogurt and pear. What do you taste?Since copra is high in fiber, you don't have to eat a lot to feel full?a few handfuls and you'll be good to go. 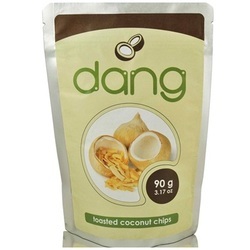 We think toasted coconut chips are the perfect snack because they satisfy your snack cravings quickly and give you a boost of energy.Many cultures around the world have been subsisting on coconuts for generations, and rightfully so. This miracle tree nut has so many uses, it might just be the most versatile crop plant in the world. The husks can be burned to produce electricity, the juice is delicious, light and packed with electrolytes, and the meat can be eaten raw for a snack, pressed into coconut milk, or toasted for a truly special experience.